Question: Top 10 Books that should be movies. Answer: There are several movies that we desperately wish could be remade, but we’ll save that EXTENSIVE list for a later date *cough* Dune... What you’ll find below are the movies that still haven’t had their shot at the big screen (assuming we didn’t overlook something in our research). The Shadow of the Wind – There are more reasons than just witnessing the Cemetery of Forgotten Books – suspense, love, action, betrayal, pyromania. We could literally go on for hours. The Hobbit – Yes, we know there have been several small scale interpretations of this novel, but we don’t consider the movie version of this epic novel complete until Peter Jackson does what he did with Lord of the Rings. Hopefully, we won’t have to wait much longer. The Eyre Affair – While this could turn out to be the most disorienting and disconnected movie of all time, we still want to see Thursday Next, the Prose Portal, and a few SpecOps-12 agents come alive on the big screen. Artemis Fowl – The LEPrecon population is woefully underrepresented in Hollywood. This novel would make a great olive branch. 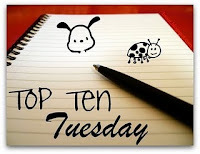 Bag of Bones – Thanks to Top 10 Tuesday, the vast research wing here at Two Bibliomaniacs has unearthed that this novel will soon become a 2011 mini-series!!! We don’t have many details, but this is cause for celebration nonetheless (We really should give this department a raise)! Napoleon’s Pyramids – The ultimate cross between James Bond and Sherlock Holmes (with a pinch of Dirk Pitt sprinkled on top). Dragon Rider – Every other book with a Dragon has been made into a movie. We want to add this one to the list. The Historian- Dracula at his finest with a love story and some digging and uncovering of the past – much like The DaVinci Code. Have a great week and head on over to The Broke and the Bookish to join the fun! Oooh Shadow of The Wind is waiting for me on my bookshelf - I can't wait to read it! And it would make a good movie too?! Well now I'll really have to move it up the line and make it my next read. I'd love to see Ender's Game made into a movie but I think this one has been on the tables for awhile now and Card had some problems with CGI. Hopefully everything falls into place and the movie does get made! Great list. You have chosen a collection of books that could (and hopefully will, because some of them are "in production") make great movies. I'm enjoying reading everyone's ideas about this. I thing The Historian would be a great movie! Good one! Great ideas, besides the Hobbit (YAY!) I think the Historian would actually make a really great film. Good news! The Hobbit is actually being filmed as we speak (er...write...er...read...whatever)! Woot! I thought about adding The Life of Pi but then I thought about it more and decided it would be quite boring as a movie. I had no idea it was already in production. The Shadow of the Wind is at the top of my list as well. Good call. Artemis Fowl would be lots of fun to watch!! The Historian would be a great movie. I'm not sure about Life of Pi. I'm concerned they wouldn't do it right. Is Ender's Game really coming out on the big screen? As a librarian I hate what happens to popular books after their movie comes out. Great list, I can't wait to see The Hobbit on the big screen. Wow! I didn't know that enders game was official! So glad you mentioned that! Quite a few of these I haven't heard of before so will have to check out! Good list! All great picks, but I have to agree with you "unmentioned" pick - DUNE. I watched the series though...and Children of Dune. I was happy with all of them! Heya i'm for the primary time here. I found this board and I to find It truly helpful & it helped me out much. I hope to provide something back and help others like you helped me.